Vacation rental house. Sleeps 18, 6 bedrooms, 6 bathrooms. No pets allowed. 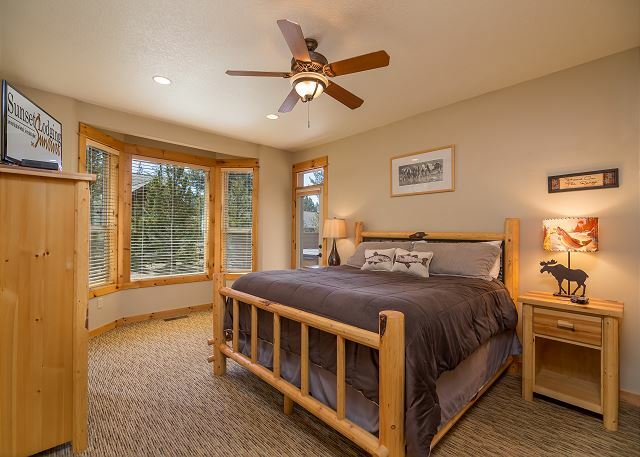 A luxurious Sunriver getaway begins when you arrive in Redwing Lane #9. 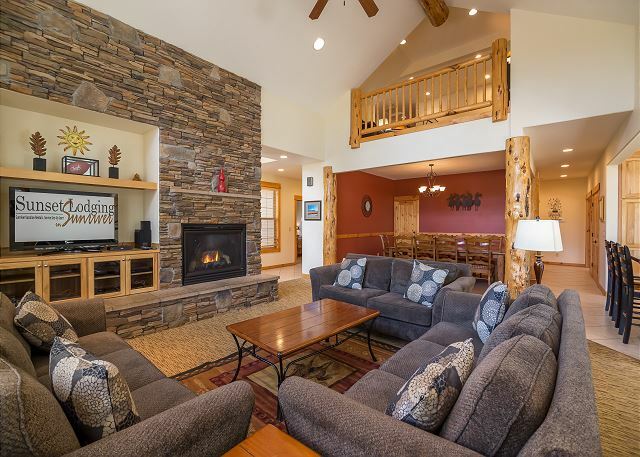 This 6 bedroom/6 bath vacation dream home is perfect for up to 18 guests. 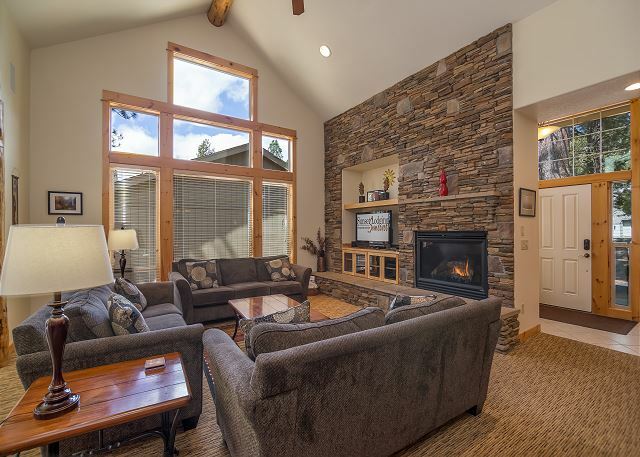 The grand living space offers plush sofas, a flat screen TV and a gas fireplace. 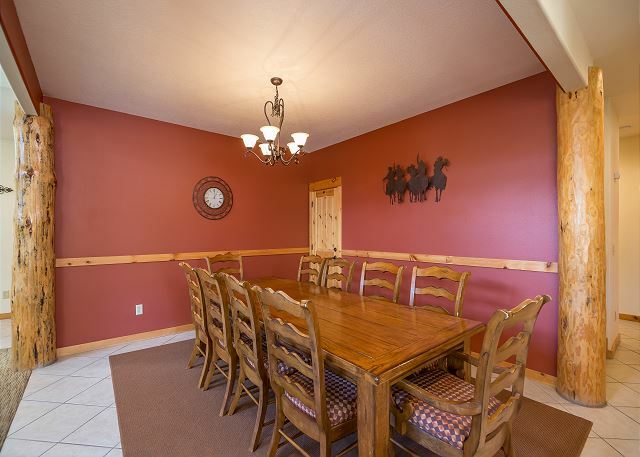 The formal dining area and the other dining space are both situated near the fully furnished kitchen. 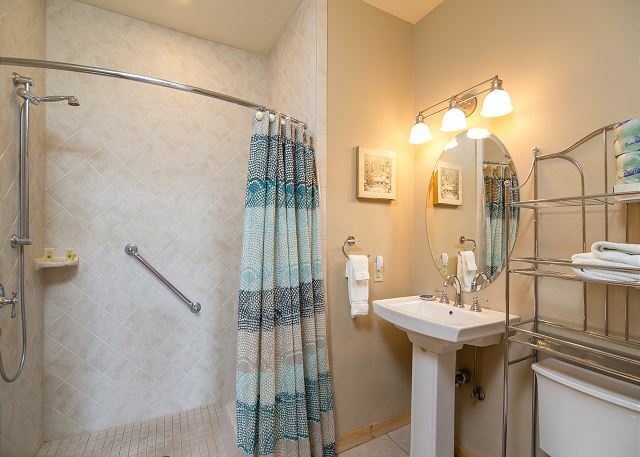 This is an ADA (American Disability Act) approved home. There are 2 master suites on the ground floor of the home, 1 king and 1 queen. 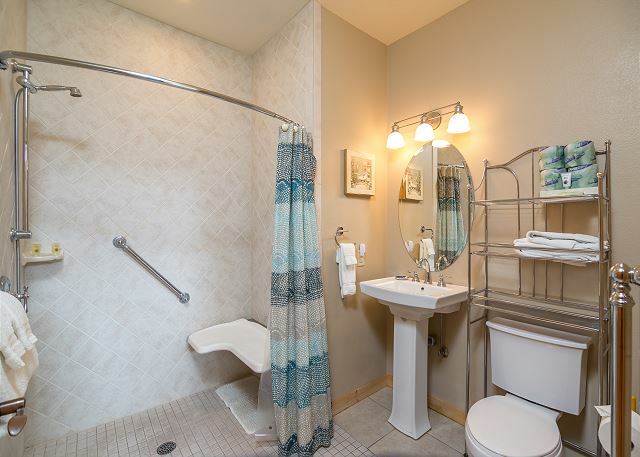 The queen suite has a handicapped accessible bathroom. 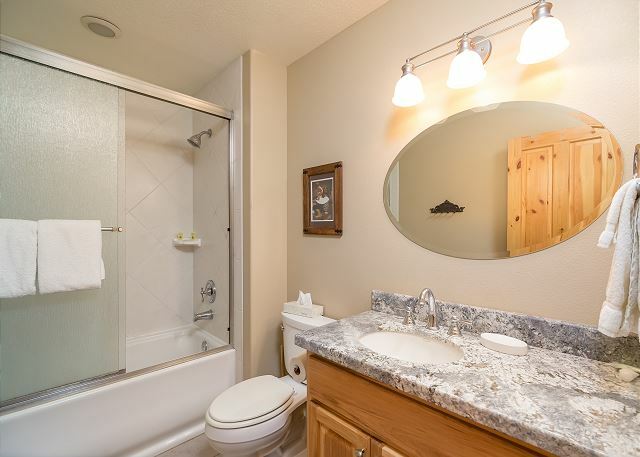 The third bedroom on the ground floor is a king that shares a common bath with the living area. 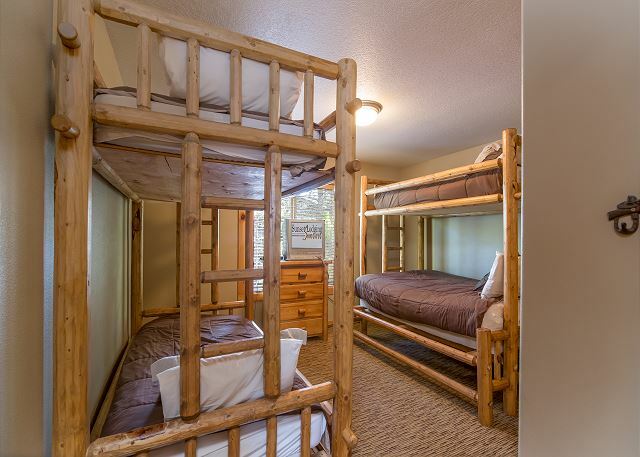 The bedrooms upstairs are a king, a queen and a bunk room with two sets of bunk beds. 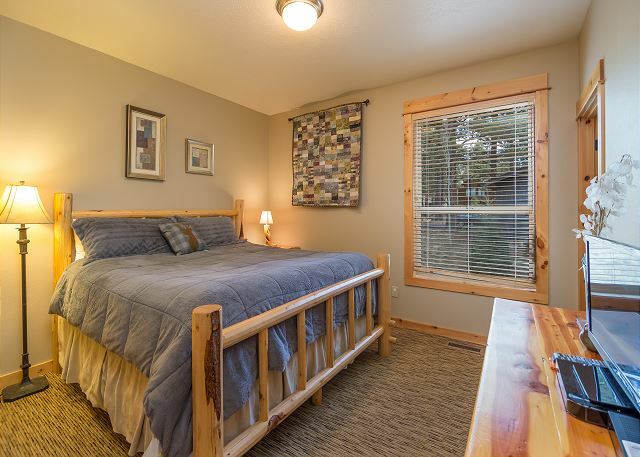 The loft has a day bed with trundle that can sleep an additional 2 guests. 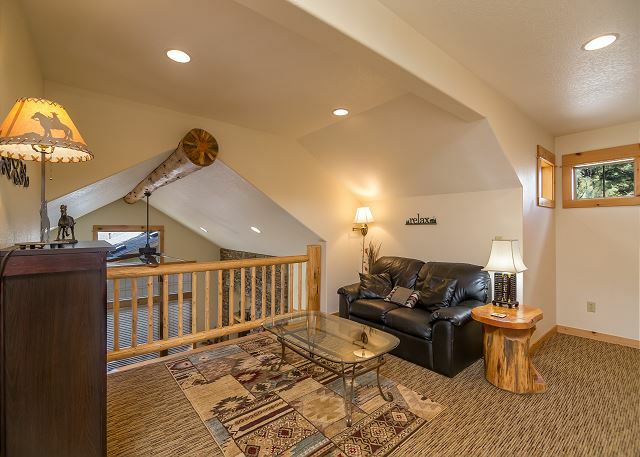 The loft area has a private seating space to read a book or take a nap. 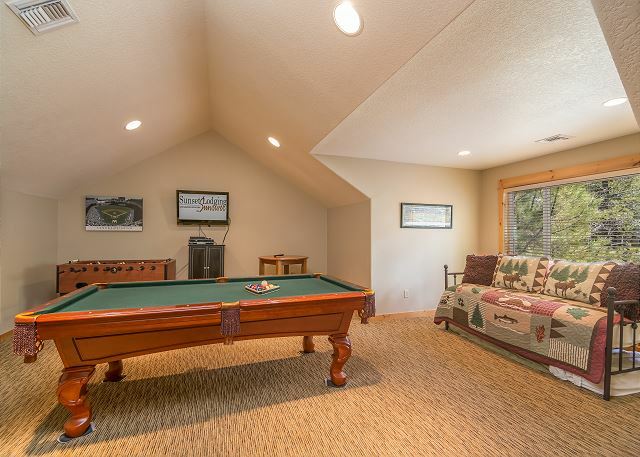 The upstairs game room has a pool table and a foosball table. 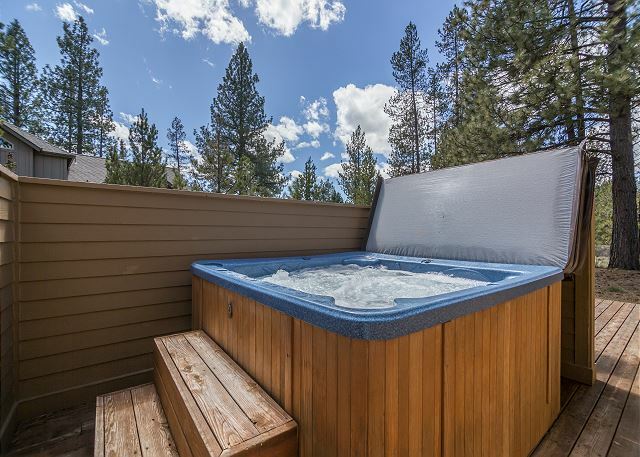 Relax in your private hot tub grab the bikes to ride the resort’s 38 miles of paved bike paths. 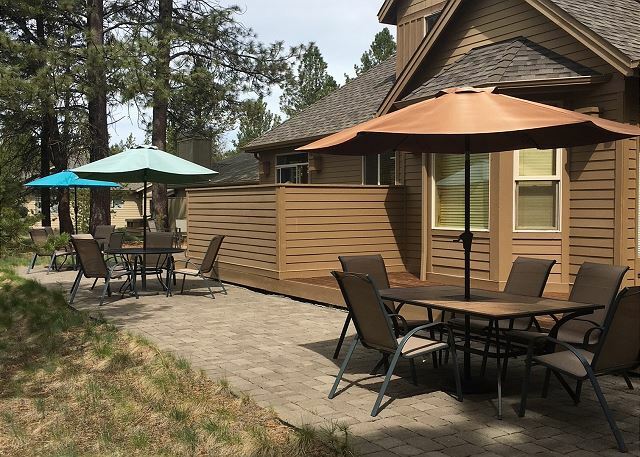 Additional perks include A/C, gas BBQ, ping pong table in the garage, portable crib and highchair and 12 unlimited use passes to SHARC Aquatic & Recreation Facility, free tennis and free access to the Sunriver Marina. 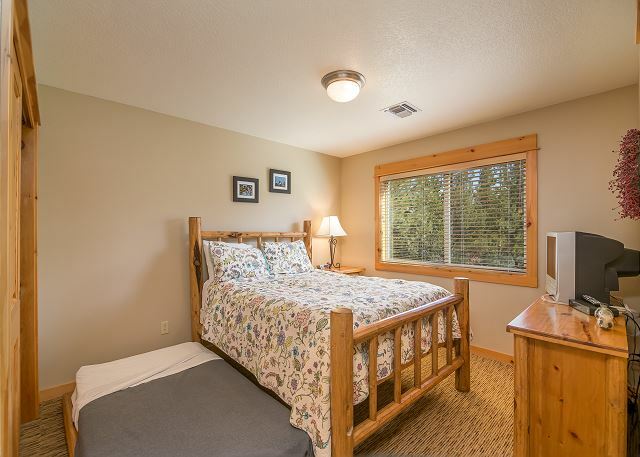 3 Kings, 1 Queen, 1 Queen with a Twin Trundle, 1 Set of Bunks, 1 Twin/Double Bunk, 1 Daybed with Trundle, 8TVs/8 DVD players, CD stereo, surround sound, oversized soaking tub in one of the master bathrooms, 4 master bedrooms, D/W, (2) W/D, 2 Fridges, double oven, microwave, deck furniture, HOT TUB, gas BBQ, bikes (6 cruisers, 1 tandem, 2 child's bikes), foosball table, pool table, ping pong table in garage, 2 levels, triple garage, portable crib, high chair, A/C, gas fireplace, the downstairs is ADA (American Disability Act) certified (the queen bedroom downstairs, living room, and kitchen are ADA certified. ), 3800 sq ft, 12 Unlimited SHARC passes. Awesome vacation ... Awesome home!! Our family reunion was a huge success due to the beautiful home and its' many amenities! Plenty of room for everyone (wonderful that each bedroom had its' own bathroom! ), the kitchen was a dream with lots of room for several cooks to be in there at once. 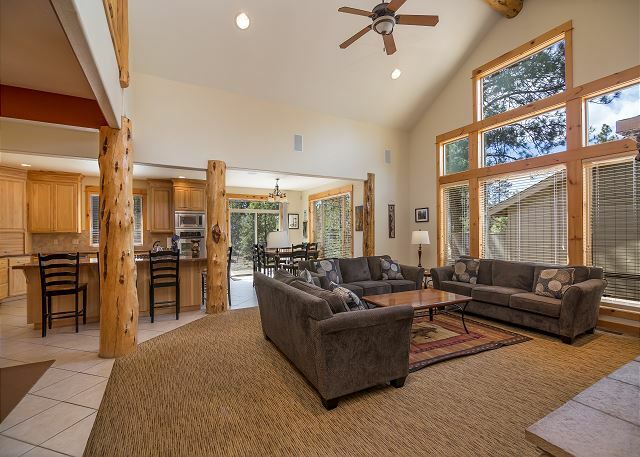 The decor of the home is relaxing with its' log beams & the beautiful rock fireplace with sofas around, all the wood accents such as the doors & moldings ... everyone was very relaxed & comfortable. We all felt "at home". Wonderful that there was so much seating for dining! Plenty of things to do - bicycling with all the bicycles provided, the guys loved the pool table, the kids loved the Sharc facility, the adults enjoyed the hot tub. The setting in the trees was peaceful with the deer visiting us several times - we even saw a family of raccoons next door & a silver fox! All in all, everyone had a fantastic time & we keep getting praised for what a great time they all had! So we are very, very happy with our choice of home! Because we had so many family members, we were running the dishwasher a lot & ran out of soap ... we called the rental office & within 20 minutes, housekeeping staff was there with a new box of dishwasher detergent! Great service! We will definitely be back! This is the second visit to Red Wing #9 for our group of 12 senior hikers from Portland. We have enjoyed the visit and the house has everything we needed for our vacation. The only thing missing was an ice cream scoop. Not bad for a group of seniors who also like cooking in the well stocked kitchen and barbecue. I have stayed at this home multiple times and will continue to do so. We plan the dates of our trips based on the availability of this home. You cannot beat the ammenities at this price level. Lovely Home for a Reunion! 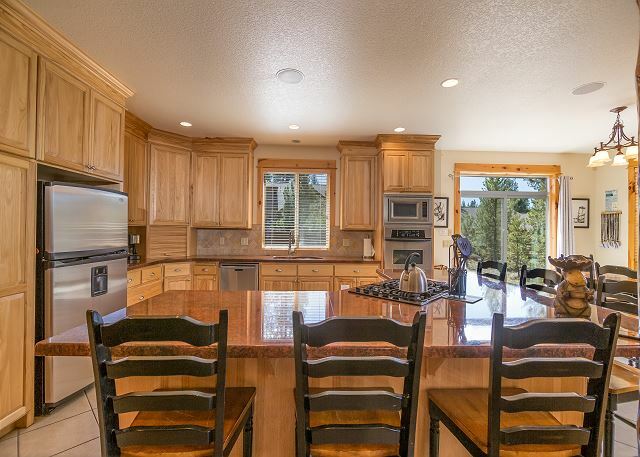 We had previously rented this lovely home in September, 2012 for a family reunion. Returned for Thanksgiving this year (2018) although fewer people ... but just as wonderful a home to stay & it works out great when you have several different families. Lots of room, plenty of bathrooms, a wonderful kitchen for cooking for everyone ... we loved it! Thank You for your 5 star Review, Samantha! We are so happy to hear that you loved the home both times you stayed there - Third times a charm you know, Come back soon! Had 14 people ranging from 3 to 75. Plenty of space. We used the bikes, the hot tub, the barbecue, and some games. Location fine for active family to walk, run or bike to village or waterfall. Thank You for the 5 star Review, Marc! 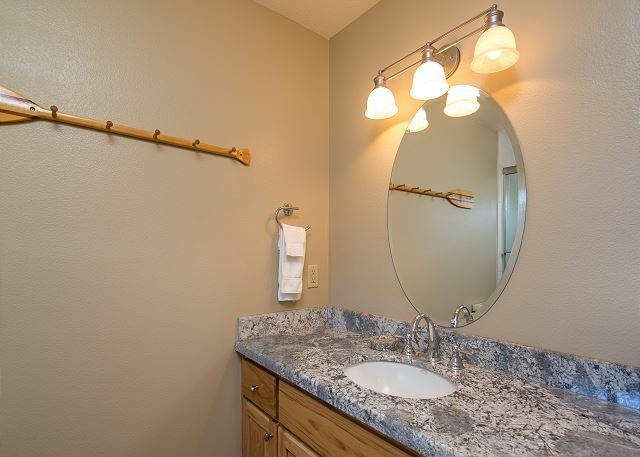 Happy to hear that you loved the location and amenities at Redwing 9! We hope to host you again! We are thrilled to return next year for another family gathering at Red Wing 9. 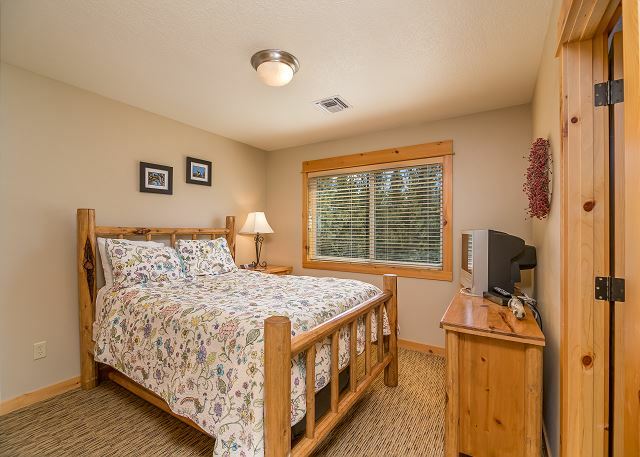 It is perfect for our needs, adults and children, and visits from local friends and family. The kids love the SHARC, as well as other recreational opportunities. Jennis! Thank You again for staying with us and the nice review, we love hosting your family every year! See you again next May! We're so glad you enjoyed your stay and the home! We can't wait to see you again in the future. This home fits our family perfectly! We like the quieter location away from the Village, which is still an easy drive or bike ride away. 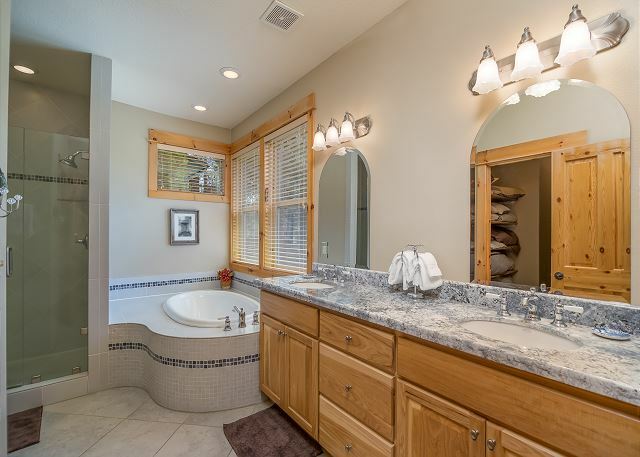 The number of beds & baths gives everyone the space they need. 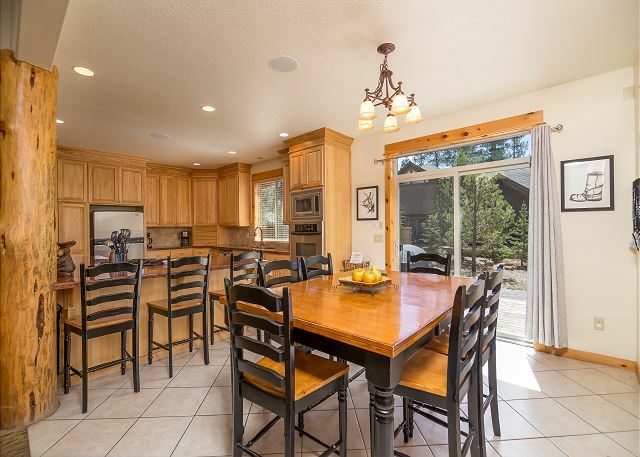 The large kitchen and gathering area are great for cooking, relaxing and fellowship. 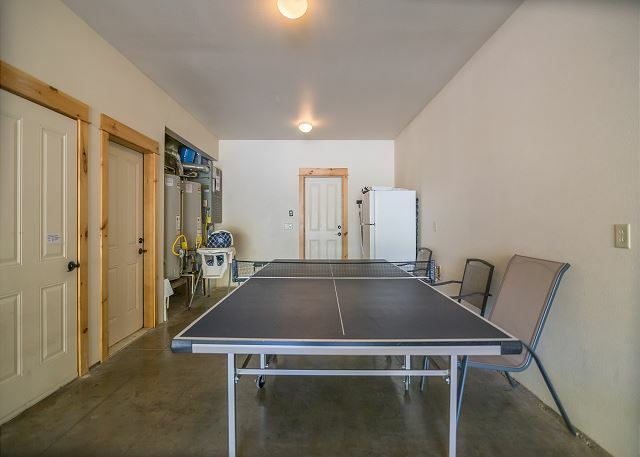 The game room is always a hit as well as the hot tub and bicycles. We had lots of fun at SHARC, Fort Rock Park and enjoyed the short walk, or ride, to view the river. We cooked and ate outside each evening and enjoyed seeing the deer in the yard at the same time. We had fun times in the Village with shopping, train rides, bumper cars, mini golf, the climbing wall, bungee bounce and slides, etc. There was also a classic car show in the Village that we enjoyed. We ate dinner at Marcello's and Pizza at Blondies. Had lunches at Sintra's, Sunriver Brewing Co. and the other large restaurant in the Village (?). Had treats from Goodies and the bakery. The home was clean and in good order when we arrived with the exception of a few cobwebs and dusty picture frames. My husband did replace the battery in the wall clock and we found that the hand mixer was not working. The new furniture and recovered dining chairs were nice. We also appreciated the sleeping arrangement in the game room. All in all, another great four generation (ages 3 mos. to 87 yrs.) family vacation! We hope to be back next year! 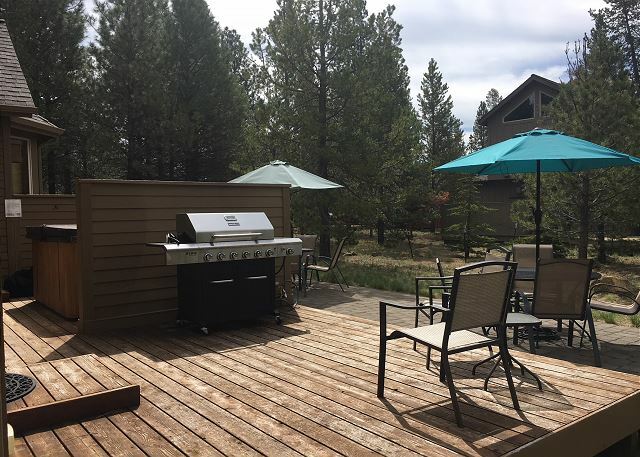 Thanks Sunriver, Sunset Lodging and home owners! Thanks so much for the detailed great review Bambi! We are so thrilled that you all enjoyed your stay in Redwing 9. We hope you visit us again soon! Redwing 9 was perfect! We needed a place for 18 for some tranquility after losing our mom. This turned into a beautiful family reunion. The house was in perfect condition, clean and well appointed. Plenty of space to spread out for everyone. 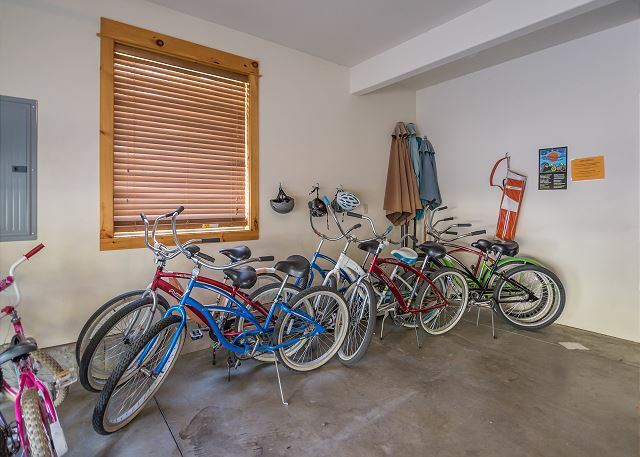 The extra amenities were a great added bonus, including: bikes, pool table, foosball, ping pong, and SHARCC passes. Would definitely recommend! Diane, Thanks so much for the great review. We are truly sorry to hear about the passing of your mom, and hope that your stay in Sunriver was relaxing and what everyone needed. 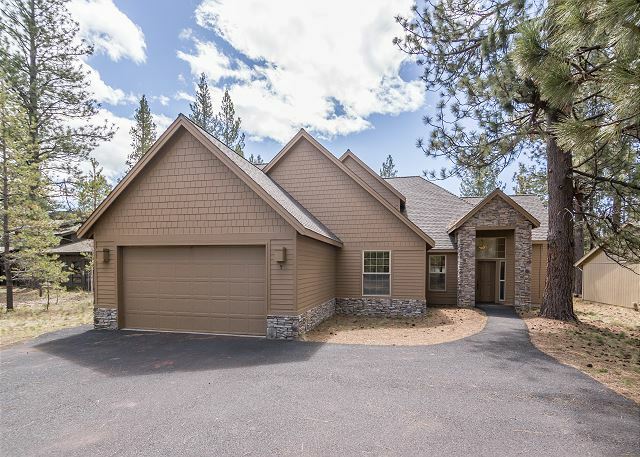 We rented 2 houses in Sunriver for our 11th tri-annual family reunion. A total of 18 adults + 5 children attended, ages 7 - 90. The weather was awesome and the accommodations were perfect. We have a fantastic time!! We are so thrilled that you had such a great time at Redwing 9 for your family reunion. 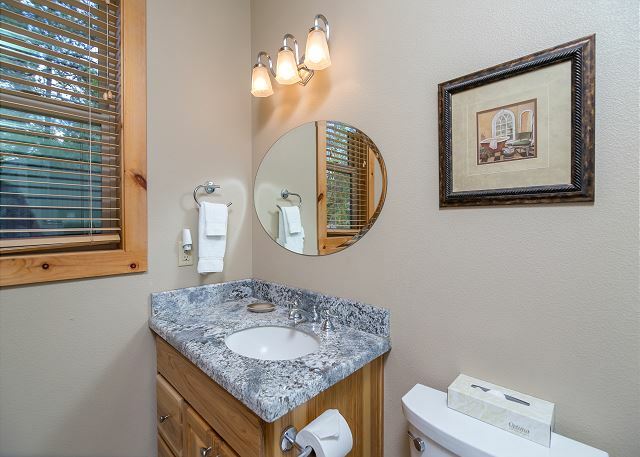 Thanks so much for the great review and we hope to see you again soon in Sunriver. The title above says it all. Great place for a family long weekend, my kids and grandkids voted unanimously to return to Red Wing 9 next year. We are so happy to hear that you LOVED Redwing #9 and will be returning next year!! It's a favorite for sure. We will see you next year! Thanks for the great review. No problems whatsoever! Highly recommend the house! We are so glad that you enjoyed your stay in Redwing 9. Please come back and see us in Sunriver soon! I have stayed at many different houses in Sunriver, and this is by far the best. Two sets of washer/dryers, two ovens, cooktop, oversized hot tub, pool table, foosball, ping pong table, many board games, etc., etc. Beds were comfortable, living room spacious, two dining tables as well as seating at the bar. This house is incredible, set up well if you want to have several families together, or a group type setting. We were there for a high school basketball team - team bonding trip. 11 players and three coaches, and all had beds to sleep in. Highly recommend this home!!! We have visited this place before and enjoy it very much. However, it seems a little rundown now. The sleeper sofa upstairs was not usable for sleeping and the matrasses on the bunk beds needs replacing. The kitchen is great. Only problem was that the upper oven did not work at all. We used the lower one, but it was really greasy inside. Needs cleaning. Kitchen is well stocked, but many of the pots and pans are in need of replacing. The green plastic chairs outside are broken and not safe. The hot tub was rather cool, but maybe there was a way to heat it that we did not know about. All in all, we love this place. Thanks for this great feedback, Gunnel!! the owners of Red Wing 9 are very responsive to their guests' feedback and we are happy to update you on the progress: 1) you were right about the oven. When Maintenance came out on 9/8 they determined that the element was shot and needed to be replaced. The new element has been installed and the oven is working. We've had Housekeeping give the lower oven a full cleaning. They are going to replace the sleeper sofa this fall. The plastic chairs on the deck have been removed and will be replaced in the Spring. We've had our hot tub division evaluate the hot tub which seems fine, so it might be that the temperature just needed to be adjusted. Gunnel, hopefully you can see how much these reviews help us get better. Thanks for the time you put into sharing this info with us. January 17, 2017 - Good news, Gunnel! The owners of Redwing 09 have removed that uncomfortable sleeper sofa and replaced it with a trundle day bed in the pool room. The sofas in the living room have been replaced as well, so when you return you will have some new furniture to try! Thanks again for providing us with your feedback, it really does make a difference! We had a wonderful time. There were so many nice things about the house and everyone from babies, teens, and grandma were comfortable. I loved there were so many tables and chairs to accommodate a crowd. Sun river is a great vacation spot. PLEASE come back soon, Diane, we loved hosting you at beautiful Redwing 9!! Great place for a family reunion. Everyone had a great time, our home was awesome! The staff was very helpful and responded immediately when we found our dishwasher in need of repair. This is our 29th Thanksgiving get together of 3 families and the 4th in a row at Redwing Nine. We were 13 this year and have been as many as 15 & 16 in years past. It is a great house for a large group of people. We arrived during a 12" - 18" snow storm. We would have liked to have a snow shovel since the garage door could not close without moving some snow away from the door. We also would have liked to shovel a path to the front door and hot tub, but we were able to make do. The upper oven had some issues tripping off during baking, but I reported that to the rental company and I suspect they will look into it. We have signed up for another Thanksgiving in 2016 at Redwing 9 and we wouldn't do that if it was not a great house for our group. David - we feel extremely blessed to be a part of your family's Thanksgiving. Does that make next year the 30th Anniversary?!? What a LEGACY!!! This is truly one of the greatest complements we get, and is THE reason we do what we do. We'll get that oven looked at and we are already counting the days until you return. Thank you for being such great guests. This is a great house for a large family. We had our kids and grand kids and everyone loved the house. Enough bathrooms so everyone had their own and the kids had their own room with bunkbeds. TV and cable up to date. Nice location and hot tub. Great to take bikes out for a ride, go for walks or take kids to SHARQ center. Would rent again. Everyone wanted to stay another week! Home was exactly the right place for our family vacation. Well equipped, in good shape. Having 2 refrigerators, ovens water heaters, game room,etc was just what we needed. We are ALWAYS so glad to hear about yet another successful family vacation. We hope you feel refreshed after your week at Redwing 9 and also hope to host the Kochs there for many years to come! Thanks for your feedback, Donna! The perfect place for the ultimate family vacation! This was the fifth year our family vacationed on the property. 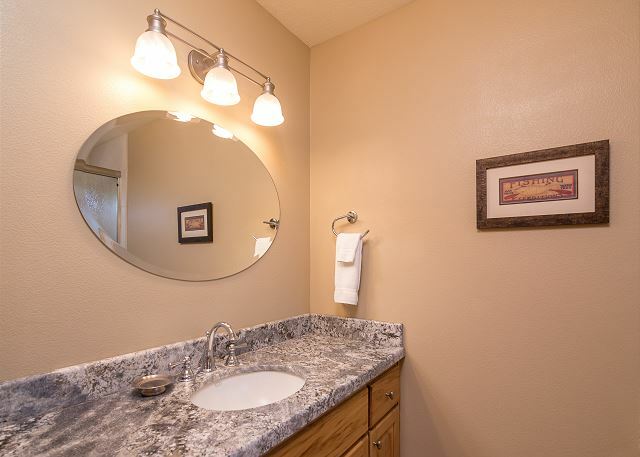 The number of bedrooms/bathrooms and the layout of the home is perfect for our family. The cousins have a great time riding bikes, playing at Fort Rock Park, the SHARC, and the activities at the Village. Some of our family enjoyed kayaking as well. The resteraunts were a nice change from the house when we wanted a break from cooking. Although, it was convenient to have the grill available for our Satuday night hamburgers, a tradition in our family! Another great family gathering and we hope to return next year! Annual girls weekend...this house worked perfect.everything we needed for kids 9 months to 65 years old. Really no view of anything but other homes but the area is beautiful. Took advantage of the SHARC passes..great facility for swimming and picnic. We have been coming to Sunriver with the same families for 18 years now. 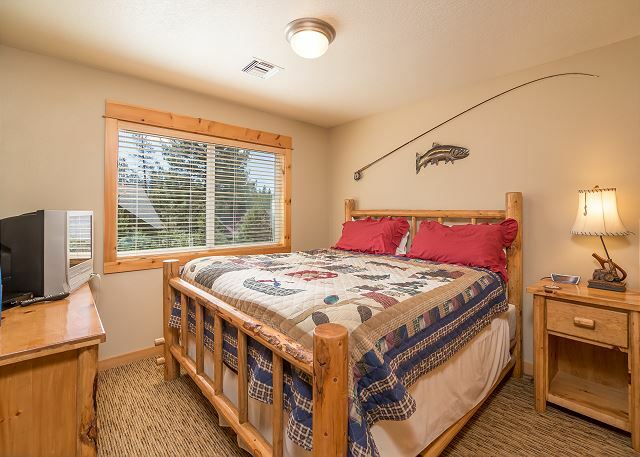 About 4 years ago, we found Redwing #9 and have been renting it over President's Day weekend ever since, The house is perfect for our large group of adults and children. Plentyh of space, fully stocked with everything but the food we eat and a great location. We hope to return for many more years to come. Had a great time with 12 of my first cousins! Loved that every couple had their own bathroom!! Plenty of room to hang out inside and out and the game room was a blast! Sounds like a great time! We hope you can make it back to Sunriver again soon! 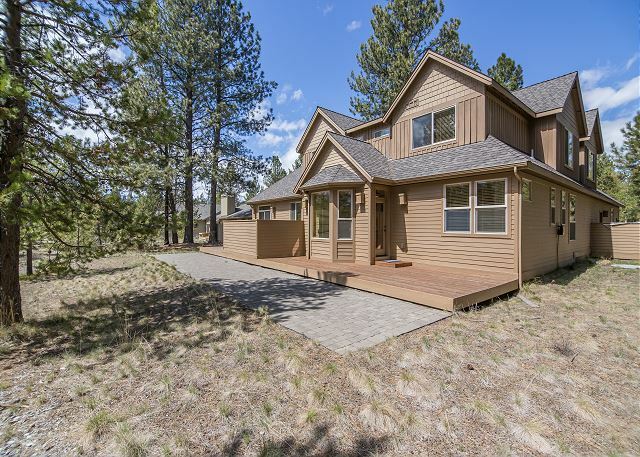 Our family has gathered for several summers at Sunriver and we've rented a different home each time. We all agreed that this one was our favorite so far. 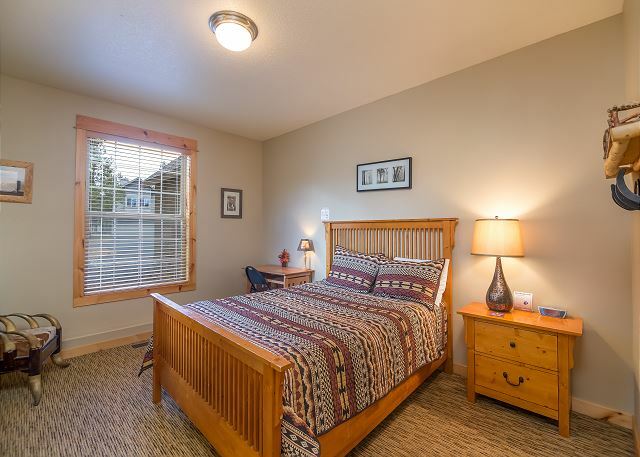 It was spacious, well laid out, had plenty of amenities, nice furnishings and is close to the river. The houses around us were not occupied so it was very quiet. We enjoyed the deer wandering through the yard and heard coyotes one night. We utilized the bikes, the barbecue, the hot tub, SHARC passes and especially the ping pong table. 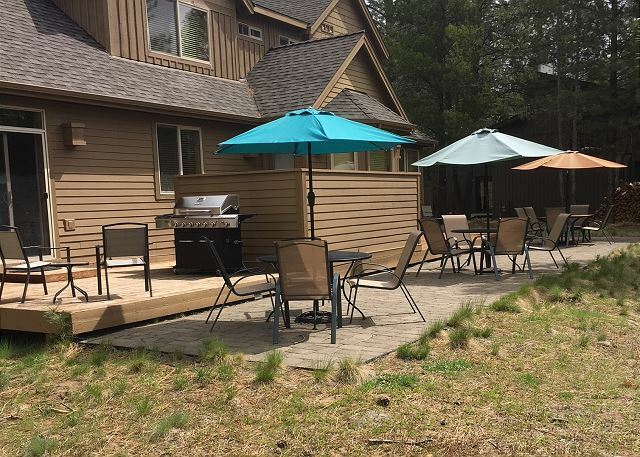 There is tons of deck area and furniture with two large outdoor tables. There is two large dining tables which allowed us to have dining in one area and ongoing puzzles on the other. As far as location, it takes ten or fifteen minutes by bike to get to SHARC and you would likely want to drive to the mall. Our group didn't mind either of these things as we prefer to be away from the hubbub. There is a lovely bench along the river just a five minute walk away. We had a problem with one of the coffee pots not working and when I called the rental company, they were at our door with a replacement within an hour. Kudos to Sunset lodging for providing me with superior service two years in a row. I will continue to rent through them. This was a great home and perfect for our large group, thank you! This was our first stay as an extended family and it was fabulous. Lots of room for everyone and everything we could have needed was there. From ages 11 months to age 60, there was plenty to do both at the house and in the area. The layout of the house was very conducive to families with a variety of ages.We are looking forward to a return stay. This home fits our family perfectly! Enough bedrooms and bathrooms that everyone is comfortable, even a perfect room for great grandma! The kitchen is spacious enough for the couples that cook and well stocked. The hot tub is always a hit with our family. We even had a rousing ping pong tournament! We were glad that SHARC was opened the last couple of days we were there. We brought our own kayaks and canoe and some of our group had a fun float down the river nearby. That are a lot of outdoor hikes and experiences close to the property that were enjoyed by several of our party. We plan to return next year for another fun family adventure! We had a golf group stay there and it slept 13 comfortably. Brand new grill was missing cover, that's about the only bad thing you could say! Staff at Sunset were great before, during and after. Thanks you for the great review!